Business Interruption After a Fire on a Commercial Property | The Voss Law Firm, P.C. ?Why would my business need legal help to file a business interruption claim? ?When is the right time to contact a policyholder attorney for help with a commercial claim for hurricane damage? ?Is there any way to speed up the process of a commercial insurance claim for property damage? When thinking about business interruption insurance coverage for your company, you may be wondering what might stop your business from functioning properly. You may also be wondering what is covered by your business interruption insurance policy in the first place. Attorney Bill Voss has talked with many policyholders affected by major losses, and he can tell you that you’re not alone. There are usually a lot of questions about business interruption coverage in the aftermath of a large loss, and the truth is that it really is complicated. Unfortunately, even if you are extremely careful and plan for the worst, disasters can strike almost any business property. There are all kinds of incidents that could severely damage your business, cause you to stop operations, and ultimately cause you to lose profits. Depending on the details of your policy, your business interruption coverage could go into effect after any number of common perils, such as hurricanes, tornados, hail, fire, and wind. However, having this coverage and understanding when and how it works are two very different things. Large losses on commercial properties are treated differently depending on the specific circumstances involved, so it can be helpful to think through your coverage on a peril-by-peril basis. To that end, let’s look at some examples of how your business interruption insurance might kick in after a major fire. Fire is one of the most common and costly perils that affect businesses, and the damage is often extensive. Structures may be completely destroyed or so damaged by smoke and soot that they are unusable. You may have to set up a temporary location to continue operating, or you may have to close your doors until sufficient repairs are made or inventory is replaced. Either way, the costs can take a big bite out of your bottom line. Thankfully, most business insurance policies cover fire losses. Business interruption insurance is often a part of the overall property insurance coverage for a commercial property. You can typically submit a business interruption claim when your business is affected by an insured loss, such as a major fire. 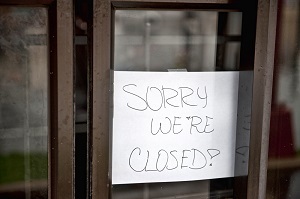 When the “business” part of your business is interrupted due to property loss from a fire, you may be covered for many of the costs of shutting down your business and restoring operations—in addition to the separate coverage for direct property losses provided in your standard fire insurance policy. Lost sales and revenues that would have been earned if the fire had not happened. Temporary relocation or evacuation from an inaccessible property. Expenses of working from a temporary location and advertising the move. The costs of maintaining utility service to a partially damaged property. Ongoing rent payments for a fire-damaged property. Other reasonable expenses related to business interruption caused by the fire. To submit a business interruption claim for a fire, it is often necessary to bring in a number of economic experts, talk with qualified contractors and fire experts, and provide extensive financial documentation. Be aware that your business interruption coverage may not kick in until a certain amount of time has passed after the fire, and there may be limits on how much the policy will pay out or for how long. Ultimately, the exceptions and limitations for business interruption coverage can vary quite a bit from policy to policy. If you have any questions about what your policy covers, read your business interruption insurance policy closely. You can also speak to your insurance agent about the particulars of your coverage. Business interruption insurance claims can be complicated and difficult to accurately prepare. It is also not uncommon for insurance companies to deny these claims or offer a reduced amount to resolve the claim. In some cases, litigation may be necessary to fairly resolve your fire insurance claim. If you have questions regarding business interruption insurance or a denied business interruption claim, we may be able to help. Call the Voss Law Firm today to schedule a consultation with one of our experienced commercial insurance claim attorneys, or read through our free book, Commercial Insurance Claims: The Basics.